The first Olympic Games in South America are over. And despite years of touting numerous “legacy” benefits of hosting the two-week spectacle, the Rio 2016 Games served to highlight that the model of staging mega events is fundamentally flawed. If the Olympics had a competition for most popular word, legacy would surely win the gold medal. The term has remained rooted in public discourse ever since Rio won the 2016 hosting rights seven years ago. A reference to the potential long-term outcomes of hosting the Games, legacy has been used to justify the massive investment needed to stage the world’s largest sporting mega event. Among the stated long lasting benefits for Rio and Brazil were new sports venues, improved transport infrastructure, increased tourism, and enhanced global trade and investment. Indeed, major plans such as the redevelopment of Porto Maravilha (“Marvelous Port”) and the extension of the Metro and BRT systems were completed just in time for the Olympics. Porto Maravilha, the redeveloped area of Rio’s Historic Downtown Port District. Yet, their completion too often came with profound consequences. Large swaths of public land transferred to large private firms. Billions of dollars in overspending to get construction sites ready in time. Major corruption allegations and scandals involving misuse of public influence and resources. The forced eviction of over 77,000 people since 2009, mostly in poor and black communities. The significant increase in homicides resulting from police “pacification” and militaristic operations, often in the same poor and black communities. The destruction of natural preserves and failure to reduce pollution. The erasure of historical and cultural heritage sites. The list goes on. 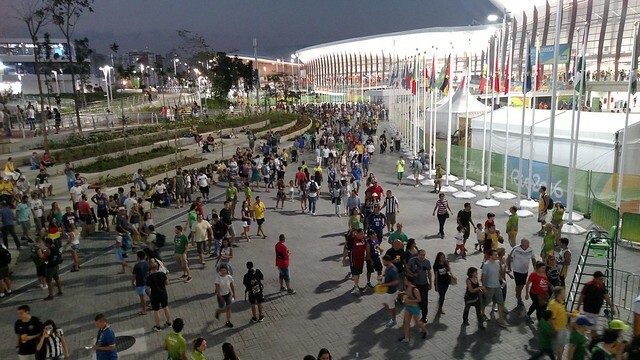 This extensive catalogue of outcomes in Rio that resulted from staging the 2016 Olympics, along with the 2014 Brazil World Cup and 2007 Pan American Games, is a further indication that mega events do not necessarily benefit their host locations. They are inherently self-serving, prioritizing the interests of sports governing bodies that stand to generate significant profits from their existing global business model, to which host destinations must agree. Host cities and countries act as temporary hubs that help to subsidize the global operations of these governing bodies. Such an arrangement enables the proliferation of elite sport venues around the world, and sustains valuable arrangements with major enterprises. In the four years leading up to the Rio 2016 Games, the International Olympic Committee accumulated $5.6 billion. This money came through the sale of broadcasting rights to networks such as NBC, and the IOC’s roster of top sponsors including Coca Cola, McDonald’s and Omega. Under this model, any benefits that address the needs of a majority of the host population are thus welcome accessories rather than indispensable requisites. Rio’s Olympic planning was complicated by an onslaught of simultaneous crises occurring across Brazil, including economic, political, corruption and health calamities. But the city’s tumultuous preparations for the Games was by no means an isolated case. In fact, all recent mega event hosts have encountered human rights violations, considerable overspending, the creation of white elephant projects, among other problems, from Beijing in 2008 and South Africa in 2010, to London in 2012 and Sochi in 2014. It is not a coincidence that fewer democratic countries are submitting bids for future Olympics, and cities like Boston, Hamburg, Oslo, Stockholm, and Brussels have cancelled their bids due to a lack of political or public support. Likewise, it is no accident that mega events are shifting towards locations with weak citizen participation and decision-making processes. Among the upcoming mega events hosts are Russia, China and Qatar. Nonetheless, the trio of mega events that transpired in Rio over the last decade have helped to expose, on a global scale, the impacts that mega events have on host destinations. Social media and the international press have been particularly valuable in publicizing the high costs and human rights concerns tied to mega events. This coverage and interconnectivity has helped Brazilians to organize large public demonstrations in protest of the massive investment in mega events. Further, it has traveled beyond Brazil, and enabled the rise of transnational solidarity and discourse on the impact of mega events, democratic empowerment, and demand for reforms. It is difficult to mantain much optimism on the potential of mega events upon observing the social and financial costs of staging the Rio Olympics. Yet, such spectacles will continue to occur in cities and nations around the world for the foreseeable future. Already, host sites for at least ten sporting mega events have been identified through 2022 (five Olympic installments, two World Cups, two Commonwealth Games, and one Pan American Games). Barra Olympic Park, the main cluster of event venues during the Rio Games. Mega events have traditionally been linked with technological innovations. They provide a showcase and opportunity for new advances in telecommunications, security measures, transportation, data collection and analysis, among other areas. In Rio for instance, security was supported by hi-tech balloons with high resolution cameras, the first time the Games employed such large-scale monitoring devices. Meanwhile, core portals supporting key aspects of the Games were hosted on the cloud for the first time ever. And Visa designed a wearable digital bracelet for athletes to quickly pay for goods at Olympic venues. As cities increasingly turn to tech innovations and smart city approaches to facilitate urban management, mega events will continue to appeal to locations seeking a platform on which to justify and carry out their innovations. Tokyo’s presentation at the Closing Ceremony in Rio was a testament to this vision. Tokyo promises nothing short of a technical revolution by the time it hosts the 2020 Games. The city’s Olympic plan includes driverless cars, robot concierges, automatic translation devices, and a robust sharing `economy model to utilize Uber, Airbnb and other services in accommodating the influx of visitors. But while technical innovations and smart city approaches may help to make the Games more efficient, they can only go so far without fundamental reforms within the existing mega event business model. A more significant ambition, then, would be to build upon the unplanned legacy of the Rio Games. The Games have provided many developments for cities and nations to leverage in collectively demanding reforms to the current mega event business model. They can point to the global media attention and awareness about the true impact of mega events, the social movements catalyzed by these events and the growing skepticism of hosting these events. Or, they can draw attention to the trend toward less democratic hosts, and the international discourse about these events. Regardless of which legacies of the Rio Games are leveraged, any proposed reforms must offer fundamental and sustained benefits to the social and economic development needs of the host community. Post and photos by Fernando Montejo.